If you happened to pass though Heathrow airport late in the summer of 2009, you may have seen a bald man sitting at a desk in the middle of the departures area of Terminal 5. He wasn’t there to register complaints. He wasn’t giving out travel information. And he wasn’t taking boarding passes. 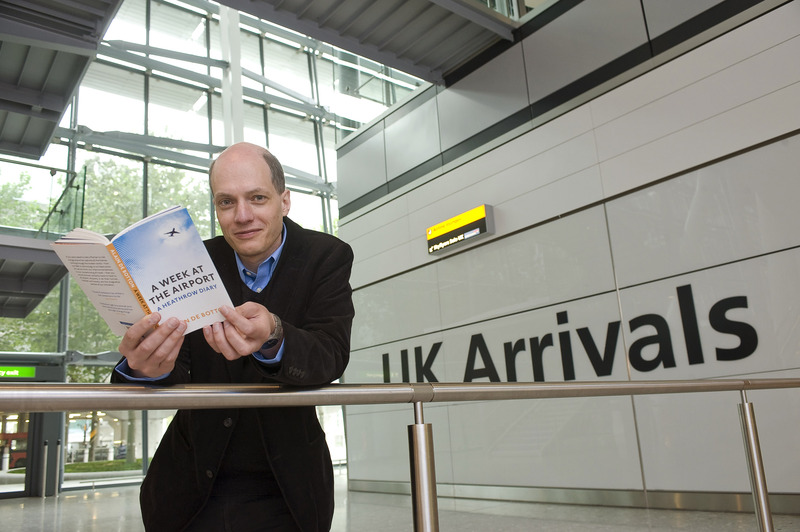 His name is Alain de Botton. He had written about many things—architecture, love, literature, travel—when he got a strange call with an offer to be Heathrow’s first ever writer-in-residence. The result of his time there is a slim book called A Week at the Airport, full of de Botton’s musings on the airport and its place in society and in our lives (and with accompanying photos by Richard Baker). It is a curious document: a meandering, looping, speculating account that uses Heathrow as a means of probing the human condition. De Botton examines the security, the food, the airport priests, the bookstores and the people passing through this porthole. “My notebooks grew thick with the anecdotes of loss and desire, snapshots of travelers’ souls on their way to the skies.” He also shows us that the place that now represents tedium and annoyance for many travelers can still be full of wonder, because, as he says, “to refuse to be awed at all might in the end be merely another kind of foolishness.” Read the interview here.